Since the announcement of 10,000 Korean Genome Project (Genome Korea) in 2015, Ulsan city has been holding an annual ‘Genome Korea Conference’ to share and promote the industrialization and commercialization of genomics in Korea. 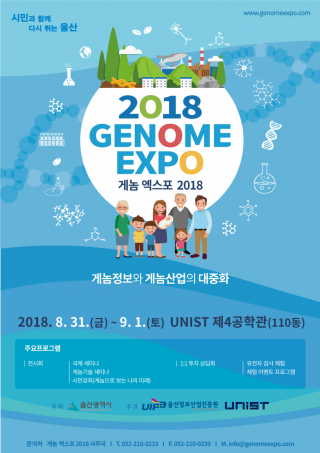 We host Genome Expo in 2018 in Ulsan to share the results of Genome Korea and the research work presented by international researchers. You can see the genomics trends in Korea in terms of some industrial players in Korea and overseas. The aim of the conference is to introduce this new technological field to the general public and business sector associates.